Here at Dad’s Blog we like our food. We talk about restaurants, the Epcot International Food and Wine Festival, and all those glorious fan favorite items on #FoodieFriday. 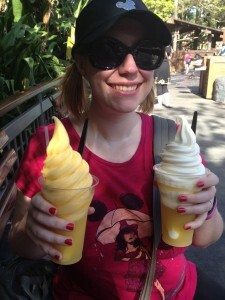 It’s high time we talk about a serious topic: dining with allergies at WDW. Did I say serious? I meant seriously delicious! For many folks with allergies or dietary restrictions, dining outside of their comfort zone (or even outside of their home) can be a major challenge, often with less than tasty results. But at WDW, the world is your oyster (see what I did there?). Not only is it possible to ask at any table service or counter service restaurant to speak with a manager or chef to discuss options that fit your needs, but often something customized can be whipped up just for you. Plus there are loads of ready to go options, like BabyCakes NYC cupcakes, fresh fruit and veggies, and many pre-packaged brand-name allergen-free snack options in the parks and resorts. Animal Kingdom even has an Allergy Kiosk serving all sorts of great things for those with special dietary needs! Did you know Dole Whips are vegan and gluten free? . Photo by Danny Shuster. But things are about to get even easier for those with food allergies. Right now, there is limited testing going on at a few WDW restaurants who are supplying allergy-conscious menus to guests, taking the guess work out of picking and choosing what options might suit them. 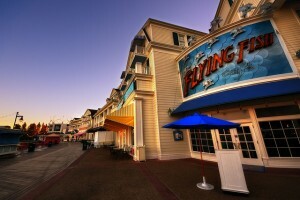 For now, find these menus at select resorts – Disney’s All Star Movies Resort (World Premier Food Court), Disney’s Polynesian Village Resort (Captain Cooks and Kona Café) and Disney’s Boardwalk (Flying Fish Café) – or at Disney’s Hollywood Studios (Sci-Fi Dine-In, ABC Commissary, and The Hollywood Brown Derby). If all goes well, I suspect these will be rolled out resort wide for the new year – or maybe even in time for the Christmas rush! And don’t forget – if you have serious allergies or dietary restrictions, just let your Walt Disney World resort hotel (or any restaurant you have Advanced Dining Reservations at) know about them in advance – this way they’ll be sure to be prepared for you. You can even have Kosher meals ordered in with advance notice! There are even special Mickey Waffles for those with allergies! Photo by Mandy Heinz. 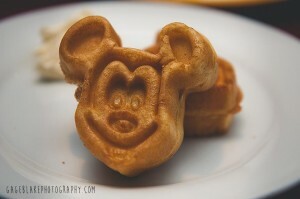 So, when dining at WDW, remember – allergies or no allergies, everyone can have their Mickey waffles and eat ‘em too!